The next course will be the weekend 25-26 February 2006. It will be at RAF Waddington (near Lincoln) where excellent facilities are available. Please contact me by email for further details. The course is run under the auspices of the RAFPBA. Tuition is given by myself (Alastair Pether, RAF Halton). We hope to build up a complete library of flourishes and drill movements which will eventually be available on-line. This is part of a massive, worldwide project and will take a long time to complete. Courses can be specially arranged at other locations, if there are sufficient numbers interested. There is usually an informal get together at the end of the course, which over two days provides enough drill and flourish training to be able to compete at a competent level. A lot of D/Ms become good friends during the course and in the contests that follow, this alone makes it a good introduction to Drum Majoring. 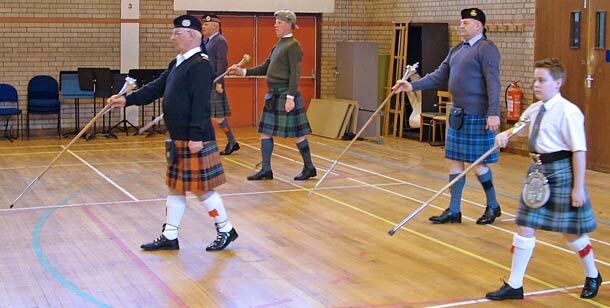 Above are the Drum Majors at a recent course learning 'the walk'.